This is the spin off from the Birthday HAWL I posted several days ago. The previous HAWL was meant to showcase the more basic cars I acquired on my Birthday. I kept these separate from the previous post because these are more on the premium side of the spectrum. Lets start off with something familiar yet so foreign to most. Some of you may remember our fellow friend MarcoIsAnF1Freak posted an Awesome Ferrari and have done a pretty thorough review. I’ll try my best to add more info and give you guys a sample of what is available considering I’m not just from but also currently in the country where these are being offered. These are promotion items at 7-11 across Taiwan from April 27th until June 5th. According to the package, these aren’t for sale; you buy things in the store to collect points and then trade the points in to get one of these bad boys. There are actually 2 ways to collect points: you buy items in the store that add up to $79 NT to get a point and once you get 6 points you can go in and trade them in. There’s a second quicker and cheaper way to collect points: You can simply buy points from them, so you first buy items add up to $79 NT to get your first point just like the first method. And then pay $35 NT for each consecutive 5 points to get up to the required 6 points. The choice is whether you want to buy food and drink while slowly collect point in the process for the car or just straight up get the points for them. MarcoIsAnF1Freak (formerly known as SimplifyThenAddLightness) showcased one of the best in the lineup, the beautiful 488 GTB. You’re about to see 11 beautiful prancing horses (there are 14 in total which I’m still working my way to get the last 3). But first... you have to build them. Since Marco already showed the assembly process of the 488, I’ll go with a 599xx which is one of the 2 most complicated ones in the series to assemble (you’ll see why). The instruction, anyone care to attempt to read this? Anyone that have played with Tech Decks (those tiny finger skateboards) know the insufferable tiny screwdrivers that come with them. The tiny screwdriver included with these are just as useless! So they’re sacked from the job and got myself a proper, larger screwdriver. It can torque the screws down better and with magnetic tip to keep the tiny screws from getting lost. This is why this car is so complicated to assemble, you have to wiggle your fingers while holding the dashboard assembly through the roll cage to install it. After the dashboard and axles are correctly placed, close it up with the body, screw in the 2 screws, and you’re done! Most of these only need 2 screws where the Ferrari FXX K needs 3. Judy try to read the instruction, good luck Carrots! While the 2 sweethearts get crackin’ on these, let’s check out a few other things I acquired. The Tomica Premium Subaru Impreza STi 22B, my favorite out of the Tomica Premium releases. The 22B, considered by many as Subaru holy grail. I love the backstory of it, I love the design and most importantly: I love Subarus. It’s also a car that’s been imprinted in my memory for a long time, ever since I was 6 years old. My dad loves cars and got me on the bandwagon too, he will buy every issue of the Taiwan car magazine and each one comes with a snippet of manga and one of the main star was a 22B. I’m so happy not only I added another homologation special to my collection, but a 22B to boot. Next up are my first TLVs, because they’re my first, I gotta pick a few special ones, like a Toyota Century, the only production car from Japan to come with enormous V12 engine. It comes with fender mirrors you install yourself, I’m gonna leave them in the package since I have no idea how to put them on, there are no slots on the casting for me put them in unless I want to ruin that beautiful silver paint. Warning: NSFW (Not Suitable For Wheelerguy) ;p seriously, as a friend, I don’t want you to go into cardiac arrest. These Ferrari promotion are fantastic, they give Kyosho a run for their money. People may even mistake them as Kyoshos, to me they’re better, the lights and wheels on the 599xx have more depth than the Kyosho and this is the first 1/64 FXX K out there. 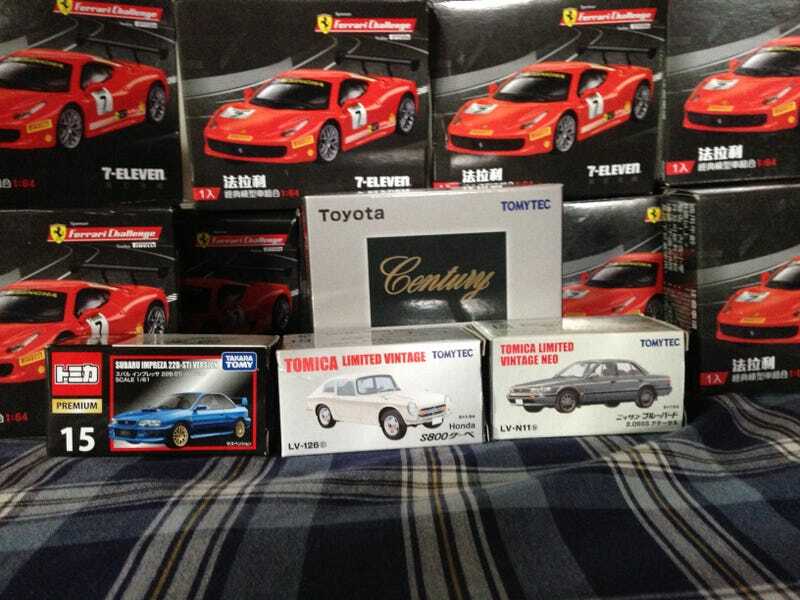 If anyone want to see additional pictures of any car in this post (including the Tomicas), feel free to comment down below. In the meantime, I’m gonna continue to admire these. Thanks for watching.